I have a confession to make; I am a Sephora addict. If I have a bad day, I go to Sephora. If I have something to celebrate, I go to Sephora. When I get paid... Well, you get the point;). While earning my coveted VIB Rouge status, I've learned a few Sephora money saving tips and shopping hacks to get the most bang for your buck when shopping for beauty and makeup products. 1.) Two Words, BEAUTY INSIDER - Sephora’s Beauty Insiderrewards program is free to sign up and let’s you earn points for perks such as a birthday gift and special savings. Those that spend $350 and $1k annually at Sephora qualify for VIB (Very Important Beauty insider) and VIB Rouge status for even more goodies like free 2-day shipping and free makeovers. 2.) 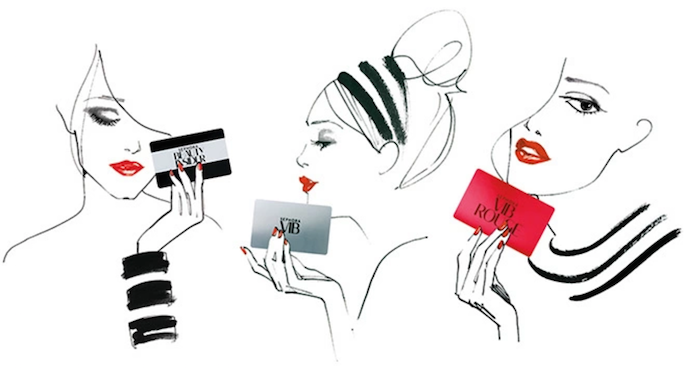 Rewards Gifts - Did you know your Beauty Insider points never expire? That’s right! So save up for a gift set you really want (like a coveted Nars set that runs out within hours of arriving). Better yet, you don’t have to make a purchase to use your points! Just head up to the cash register for your Beauty Insider freebie and be on your way. 3.) Sales -Mark your calendars now. Sephora has two annual sales - April and November - which give beauty insider members 10%-20% off everything in the store! Other than that, sales are slim but occasional “Beauty Steals” are usually located at the end of a row of products. Also - If you did purchase an item within 2 weeks of before it went on sale, Sephora will refund the difference. 4.) Samples, samples, samples! 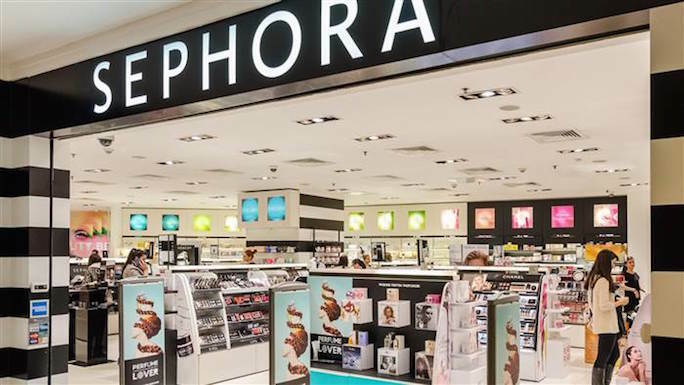 - Do NOT leave a Sephora without taking home your fare share of free samples. Employees don’t mind making samples of products and customers are allowed up to three per section (that means 3 samples of fragrance, 3 of beauty, 3 of skincare…). If you don’t remember while you shop, ask for samples at checkout where they have a variety for gifting cosmetic crazy customers. 5.) 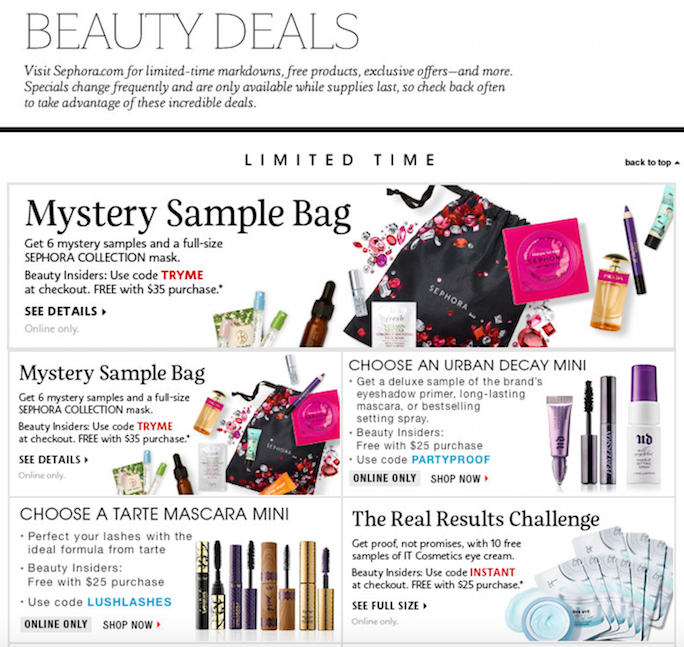 Beauty Deals - It may be hard to find, but Sephora’s BeautyDeals page online is well worth the search! It shows all the promo offers available and has great high-end delux free samples. If you have your heart set on multiple samples just buy your paid for products in multiple orders to load up on the freebies. 6.) Free Makeovers - Get your beat on! Sephora offers free 15 minute mini-makeovers that focus on one feature such as a smoky eye or bold lip. For those that want a complete overhaul, a full (45 minute) makeover is free with a $50 purchase and anytime for Rouge members! If you’re going to an event, make sure to book a reservation online – appointments fill up fast during holiday and wedding seasons. 7.) Returns - Don’t like your new lipstick shade? Don’t worry, because Sephora will return anything bought from the store even if the product is almost all used. No receipt? No problem – you can make a return for store credit as long as you have an ID (and if you do have the receipt receive a dull refund to original payment). 8.) Perfume Sample Sets - If there is a fragrance you like in a Sephora perfume sampler set, buy it! The sample sets are $55 and give you a coupon for a FREE FULL SIZE BOTTLE of one of the fragrances included. 9.) Beauty Classes -Learn to do your makeup like a pro! 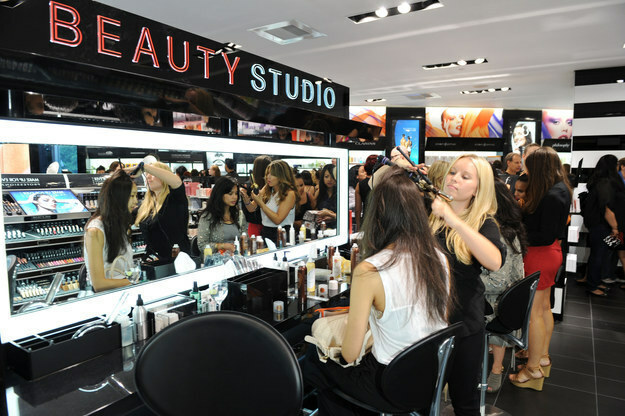 Sephora offers free “Beauty Classes” at select locations nationwide. The classes range from 45-90 minutes and class topics cover everything from applying false eyelashes to contour and highlighting.